It’s a crystal bright autumnal day and even thought it’s still only a Friday, Brighton beach is teeming with people ‘taking the ozone’ in traditional Victorian fashion. I have the day off again. Lying in bed I had been trying to decide where to spend it. It had been very overcast the day before, perhaps a little too so and the results from that day (spent in London) had been very flat looking images. The high sides of London that had acted to reduce the light even further had compounded the problem and left me a little frustrated. I don’t have many days where I can take off with my camera to wander and explore so any day lost to the lack of light is frustrating. I deliberate in my mind before getting out of bed, Brighton or London, Brighton or London, Brighton or London. The trope becomes like the rhythmic beat of a train on the tracks. I decide that the proximity of Brighton and the extra hour in bed it will give me is an easy decision to make. I also figure that the coast is a better choice as there will be more light if the day ends up being as overcast as it was on the previous. Brighton has only one high side to north but to the south, the vast expanse of open water just acts like a great big reflector. Even if you have thick cloud cover, you almost always get some good light by the sea. Of course this being the UK and autumn the weather is a changeable as a Crowded House song and within an hour or so of arriving, every single solitary cloud decided to feck off and leave me with the brightest and harshest of direct light. So much for nature’s soft box and it’s not like I can fold up the vast reflector either and put it in my bag. Arse; looks like I’m going to be shooting cliché silhouettes for the day rather than anything meaningful. I tramp over the pebbled beach trying to see something worth shooting but the pickings are slim, mostly just flotsam and jetsam. And then I see this guy, reclining on an drainage cover as if it were Chippendale chaise long, utterly absorbed in smoking the fattest cigar I’ve ever seen and basking in the glorious sunshine as is this was the first time he’d ever experienced it. My heart skips a beat; this a moment too good to miss. I take a few shots surreptitiously thinking that a candid would be the best way to compose the picture but I only have a 50mm lens so I need to get closer and I’m in the wrong position to get the best shot; the background I have is dull red brick and too fussy; I need the clean expanse of sea and sky to really frame the moment. I approach and then notice that a woman, younger than he but still older than I, appears to be taking his picture with her phone so I try to engage her and start up a conversation. It turns out she’s actually on the phone so I turn to the gentleman instead and start to talk. I’m aware that the woman, still on the phone but now no longer holding it up to the gentleman is concerned I’m trying to sell him something. There’s a brief moment between me trying to start a conversation, her juggling a phone call with protestations that they aren’t interested in buying anything and him almost chuckling to himself as he watches, puffing on his cigar, where I almost give up. But I don’t and I get a lucky break. “Is that a Leica?” he suddenly asks me. OK so my camera is indeed a Leica and it does have that word in unhelpfully bright white lettering daubed on the front, but still, he’s pronounced the word correctly and clearly recognised the significance of the brand. I tell him it is indeed and ask him if he is also a photographer. “I used to be, a long time ago” he replies. His accent is wonderfully rich, almost melodic but with that hard to place edge that sounds like it might be central European but isn’t like any other Slavic accent you hear so frequently. “Your accent is interesting, are you Hungarian?” I ask. He looks at me and a broad smile spreads across his face as he grips the cigar in his teeth. He looks every inch like George Burns. I’m in and excited. Truth is most definitely stranger than fiction. The conversation runs wildly from improbable situation to improbable outcome. It turns out that George (it is indeed his name) is Hungarian. 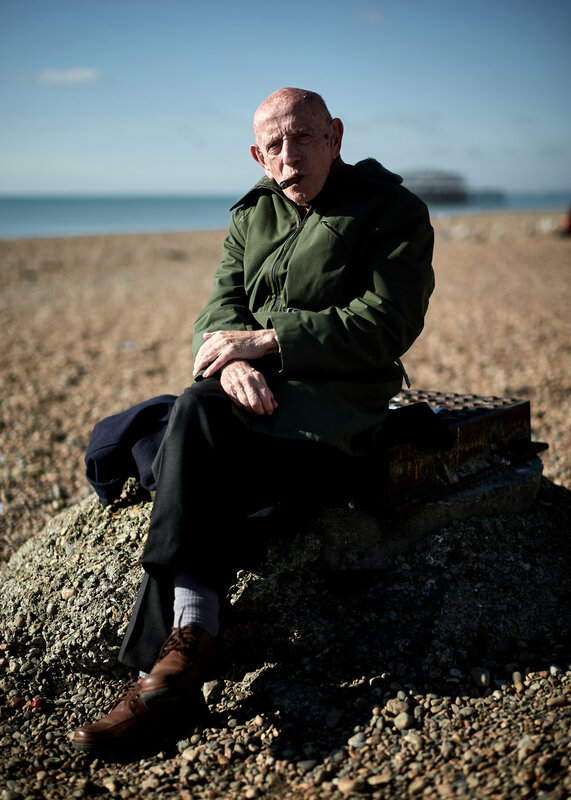 He came to the UK in 1954 as a refugee, escaping the tyranny of Soviet communism in his country by hiding in the bottom of a false boot of a car. He was driven to the border where he cut the razor wire and under the cover of darkness, crawled through the minefield of no-man’s land and into Austria. From there he made his way to the UK to plead for asylum, which he was granted and then he spent his life here, working at various times as a photographer and sometimes a life guard. He raised a family having met his wife on the beach while swimming. He confesses to me that his approach to her had been based on wanting to show her what she was doing wrong with her strokes. It’s less an example of ‘mansplaining’ and more a reflection of his physical strength and capability. Even now in his late 80s he is a robust individual. In turn, I share my own family's history, recounting how they had been in a similar position as Polish refugees after the war and the shared history of having been at the mercy of the turmoil of both communism and war means we bond just a little. I am deferential and deeply respectful of George and fight the urge to give him a thankful hug. The woman taking his picture is his daughter who now lives in Australia. She had been on the phone to her brother and had been face timing him so that he can see their father enjoying himself in the sunshine, smoking his cigar. You see this day that I approached him and found him as I did, without an apparent care in the world, is the first day in six months that he has felt this unburdened. Six months ago he lost his wife and for six months he has been sitting at home mourning her loss. Today is different. Today he is happy again and is happy to be photographed and I am honoured to be the one to do so and share those results with him and his daughter. The light though is really not playing ball. It’s coming in from over the sea at a diagonal angle so framing him with the sea in the background means that one side of his face is completely in shadow, the other brightly lit. I try to frame him from the other side but then I just have the messy promenade in the background and that feels all wrong. I decide instead on this composition and tentatively suggest maybe we could do something more arranged, perhaps at his home but this offer is robustly denied. But I am happy with this result; happiest because the image, while far from perfect, is a moment in an otherwise remarkable life that I have been privileged to share and because I had the opportunity to pay my respects to someone from a generation that lived through the worst ravages of humanity and came out the other side. I say thank you for what he did and take my leave.